You are here: Abbeyrose Foundation / News & Announcements / June 2015 Tip – Secondhand smoke is harmful to your pets! June 2015 Tip – Secondhand smoke is harmful to your pets! The lungs of dogs and cats are similar to ours and can be damaged by secondhand smoke. Just like humans, our pets are exposed to cigarette smoke by direct inhalation of secondhand smoke and indirectly when they lie on carpet, furniture, clothing, or other surfaces exposed to cigarette smoke. They also carry smoke particles around in their fur and can ingest them when grooming themselves. Research from the University of Minnesota demonstrated that cats who live with smokers have nicotine and other toxins in their urine. Tuffs University reported that cats living with smokers are twice as likely to develop malignant lymphoma. Colorado State University reported that dogs living with smokers have a 60% greater risk of lung cancer. You can read about the cited research by following these links. 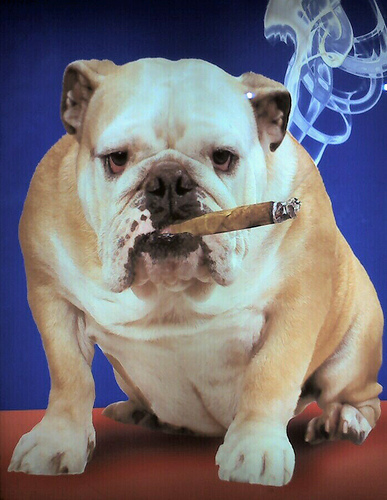 One Response to June 2015 Tip – Secondhand smoke is harmful to your pets! Cigarette smoking is just the tip of the iceberg. What about pot, crack, and other experimental drugs? Would you expose these to a child? The answer, hopefully is no. Same thing should apply to pets. I find this very interesting that some of the research was done in Colorado.